Just from the title, we know this is going to be a silly picture book and we are not disappointed. Apparently, you should always carry a banana with you because there are so many gorillas hiding in plain sight amongst the human population. The comic book style artwork underlines this theme by giving the Gorilla characters more detail than the human characters. 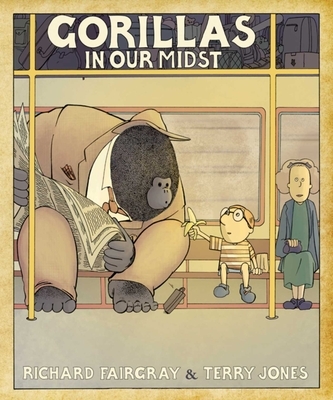 But the thing to really look out for are the jokes in the illustrations, for example a gorilla reading a book on a train entitled "How to Read on a Train" or another Gorilla wearing a t-shirt that says "I Am Not a Gorilla". The perfect gift for little monkeys or for the ape in all of us.